As you can see, I’ve posted two pictures this for this week of the prompt. An old, well worn, traditional snow globe Christmas decoration, and then the slightly psychedelic reindeer that I fell in love with last week at Target. Both taken in front of our Christmas tree, I felt that the black and white of the first picture aptly reflected the item’s age, whereas the clashing, vibrant colours of the second illustrate the modern products in all their wonderful garish glory. I took both images with my Canon DSLR paired with my 50mm 1.4 lens. For image #1, my settings were ISO 2000, shutter speed 1/125 and aperture f/2.0. 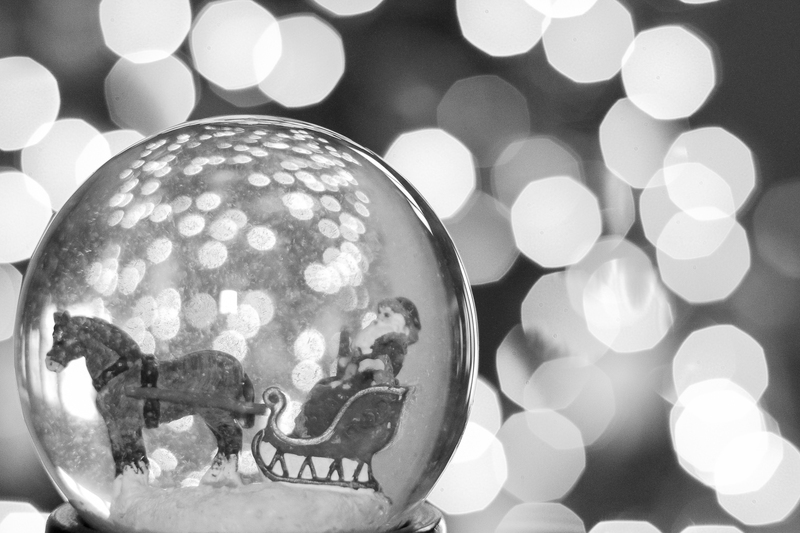 I held the snow globe in my left hand outstretched a few feet away from the tree and snapped the picture holding the camera in my right hand. Post processing in Lightroom 4 I cropped and leveled the angle of the image, then converted to black and white. I increased the exposure, but decreased the contrast, highlights and whites, before sharpening the image. For photo #2, my settings were ISO 1250, shutter speed 1/150 and aperture f/2.0. 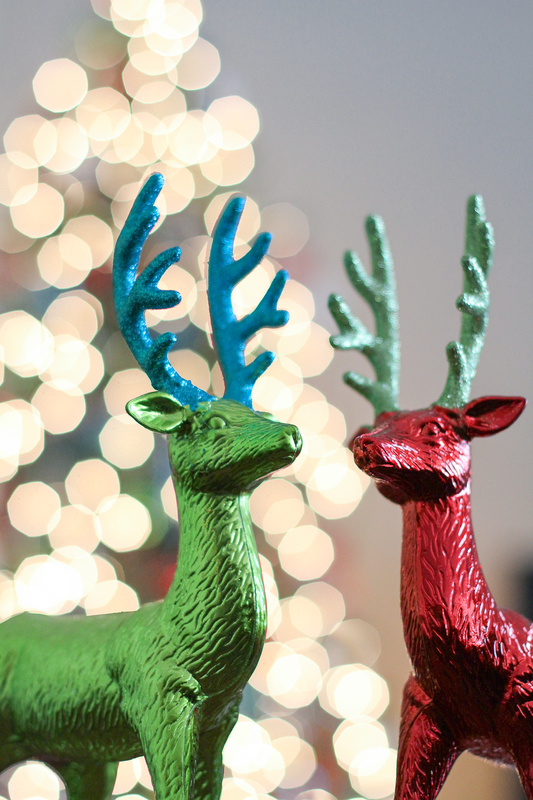 I placed the two reindeer on a table, and then angled underneath the subjects with the christmas tree on the other side of the room behind them. Post processing in Lightroom 4 yet again, I decreased the temperature and contrast a little, and then increased the shadows and blacks. I finally increased the saturation of the blues in the image, increased the luminance of the greens, and decreased the luminance of the blues. 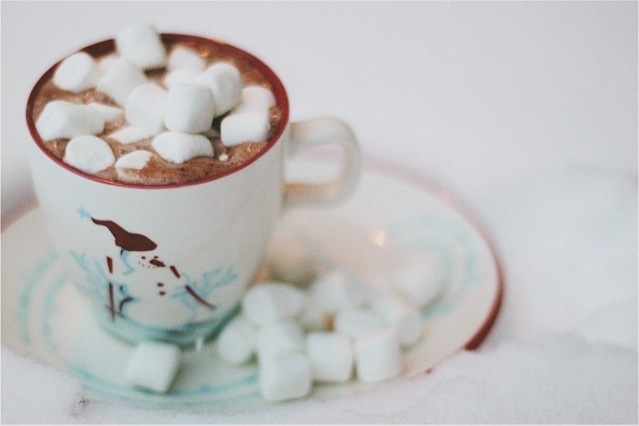 Hot cocoa in the snow, with a side of marshmallows. An old classic treat on a snowy December day. The cup, an oldie but goodie. We have a set, one for my daughter and one for my son. The snow, new. Another five inches fell today. I shot this photo with my Canon DSLR with my 50 mm 1.4 lens attached. It was 4:00 pm, just 30 minutes from dark, so I adjusted my settings accordingly. My ISO was 1600, aperture 1.4 and my shutter speed 1/400. For the edit, I adjusted the white balance, sharpened both the radius and detail, and decreased the contrast in lightroom. I then slightly faded the photo and increased the fill on the VSCO app.